Last weekend birders in Cumberland and Cape May counties took to the field in an effort to find any rare birds that may have arrived on the strong southwest and northwest winds that prevailed in the weeks prior. The date was a bit late for the ‘peak’ rarity season (usually early November) but after reading the reports from Maryland and Maine, where roundups had already occurred, how could we not join in the fun? A little over a week ago I sent out an email probe to see who might be interested in participating and was immediately met with a few enthusiastic candidates. Clay Sutton seemed particularly excited about the prospect of coordinating Cumberland County and he immediately rallied the local troops north of the Delaware Bay shore. Down here in Cape May we had a dozen or so participants commit to covering various locations throughout the three-day weekend. 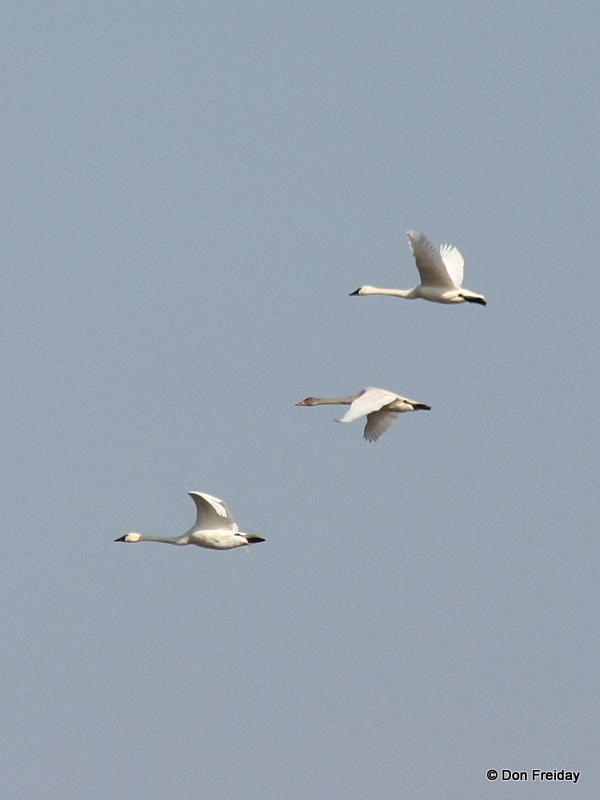 While no mega rarities were found, we did turn up a few good November birds. Interestingly we dipped on Ash Throated Flycatcher for the weekend, even after one was seen just before and after the roundup weekend. Such is the world of birds. Regardless, it was a great excuse to get out into some less-frequented habitat and see what was around. Next year we plan to hold our second annual Cape Cumberland Rarity Roundup on the weekend of 11/11/11… that date just screams rarity, does it not? Mark your calendars! Thanks to everyone who pulled together to get this thing rolling despite all of the holiday responsibilities. For an inaugural event it was clearly a success. 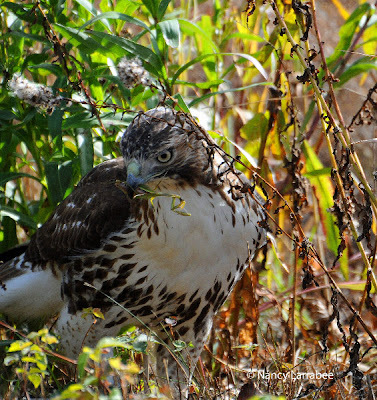 Hard to believe it's the last day of the hawkwatch. 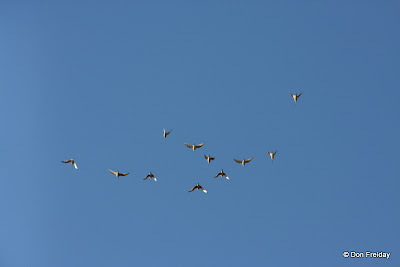 Doug Gochfeld and I were talking about the season as we watched the non-flight this morning (southeast winds). 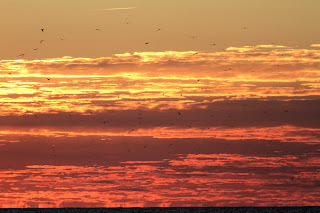 This season had it all, it seems, everything Cape May is known for - huge Monarch migration, several major and one epic passerine flight, a great hawk migration (47,537 raptors were counted as of yesterday), a record Red-throated Loon day at the seawatch. We'll have tales to tell in the 2011 Pergrine Observer, that's for sure. The bird of today was Fox Sparrow, at least for me. At one point I had 7 in one tree at Hidden Valley, and laid eyes on at least 40 all told, a few of which were singing and many of which gave their distinctive, high-pitched seep. Sunday at Stone Harbor I had a dozen shorebird species, not bad for late November: Black-bellied Plover, Semipalmated Plover, American Oystercatcher, Greater Yellowlegs, "Western" Willet, Marbled Godwit, Ruddy Turnstone, Sanderling, Western Sandpiper, Purple Sandpiper, Dunlin, and dowitcher "sp." Most of these were at Stone Harbor Point, on the beach or jetties not so far up and down from the access at the Second Avenue parking lot. Having been away in South Carolina for Thanksgiving (a great excuse to visit the amazing Congaree Swamp as well as relatives), this morning was my first opportunity to pay homage to the Cave Swallows at Congress Hall. Having heard that the birds didn't appear to be in good shape over the last couple of days, I feared the worst, but came away with mixed feelings. I met Stephen Bagen first off and heard how one of the swallows had fallen from a ledge and literally passed away in his hands in the frosty cold of early morning, while the plight of the swallows seemed to have been made worse by the presence of a chunky adult female Cooper's Hawk that was not to be detered from an easy lunch. However, fortunes were mixed for the Cave Swallows, and it is nice to be able to report that at least six were flying seemingly quite strongly, further along the beach front near the Sea Crest Inn and enjoyed some warm sunshine as they preened from a nearby balcony. Things were quiet elsewhere, but Doug seemed to be having a reasonable day at the Hawkwatch Platform (a nice adult Bald Eagle passed over when I dropped in lunchtime), Lighthouse Pond remains full of ducks and Northern Gannets were constantly in view over The Rips - so there's planty to keep us all busy!! Don't forget, Tuesday will be the last official day of the Hawkwatch for 2010 so if you are in the area, do drop by and see Melissa and Doug and thank them for a job well done (they might appreciate a doughnut too!). 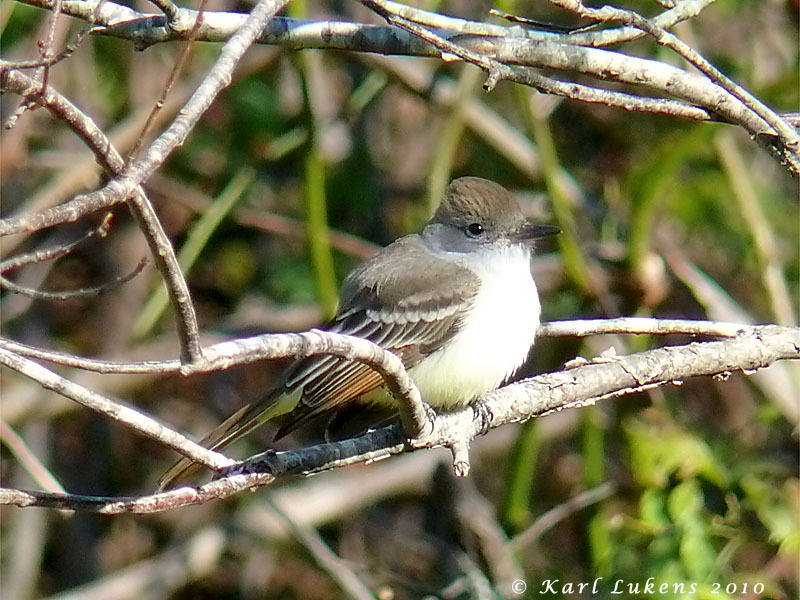 Chris Vogel found the season's fourth Ash-throated Flycatcher this morning, this one at Hidden Valley and photographed nicely (above) by Karl Lukens. There was some suggestion that there were two individuals present there, but this went unconfirmed. Doug Gochfeld noted two Baltimore Orioles in the junipers at the State Park and Tom Reed reported a light-morph Rough-legged Hawk (presumably a juvenile) from Jake's Landing. I spent most of the day in Delaware waters doing at-sea bird surveys, but did take an awful lot of pictures of the spectacular sunset this evening while coming into Cape May harbor. The below picture is taken from the boat while between the two jetties. 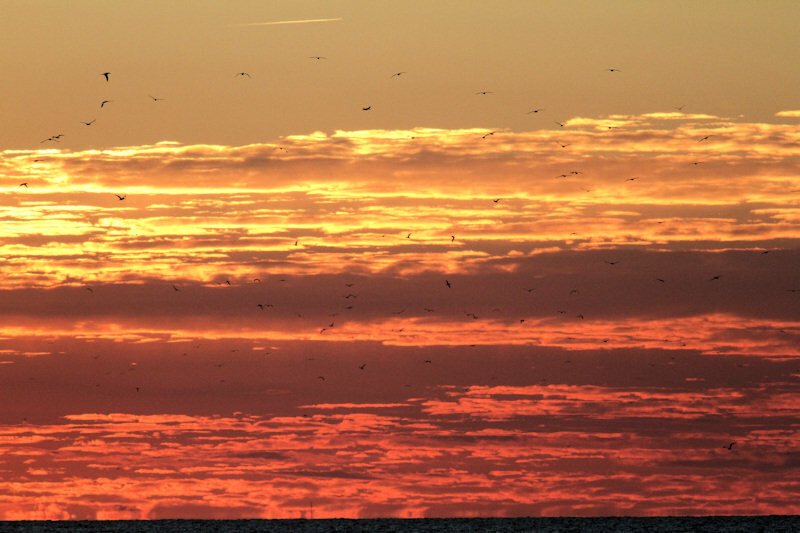 The subject is not simply the sunset, but the spectacle of gobs of Northern Gannets attacking baitfish with hopes of getting a little bedtime snack. I counted at least 106 gannets in this picture, and this picture represents less than a quarter of the field of veiw that contained foraging gannets. 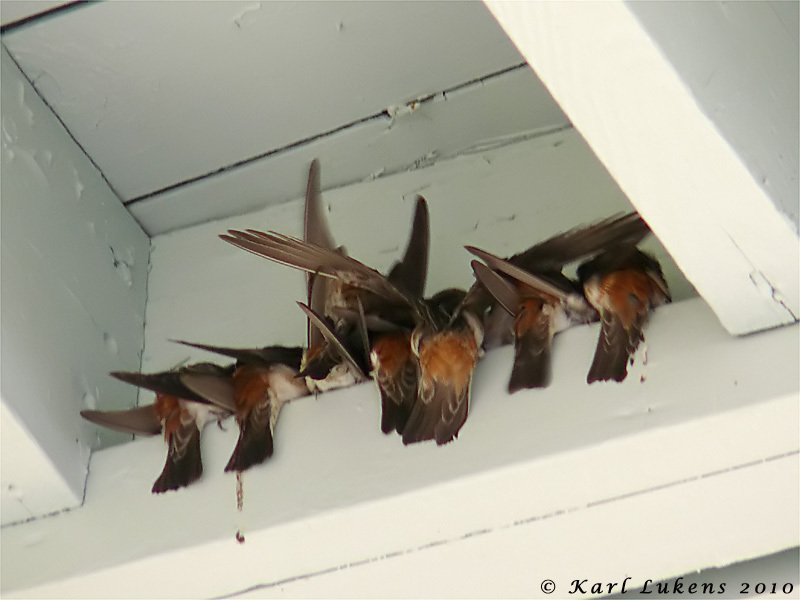 Doug Gochfeld took this footage of Cave Swallows roosting at Congress Hall. http://vimeo.com/17249494 from Doug Gochfeld on Vimeo. While some of the Cave Swallows that roosted along the Cape May beachfront perished in cold temperatures overnight, a number of them survived to fly another day. Doug Gochfeld (above with some of the swallows) and others kept tabs on the birds last night and early this morning. Throughout the day, the hawkwatch in Cape May Point State Park was rarely without a small group of Cave Swallows zipping around. 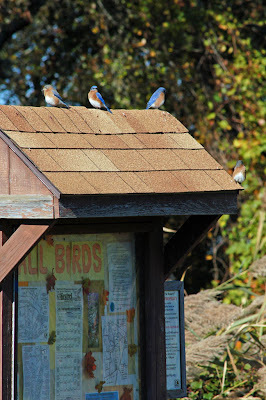 Karl Lukens provided the above photo of Cave Swallows at Congress Hall in Cape May around 1:30 pm. Doug Gochfeld reported a rough estimate of 75 there around 3 pm, but said that it was difficult to count them in the tight heat-conserving mass in which the birds were perched, though he could count at least 55 tails. 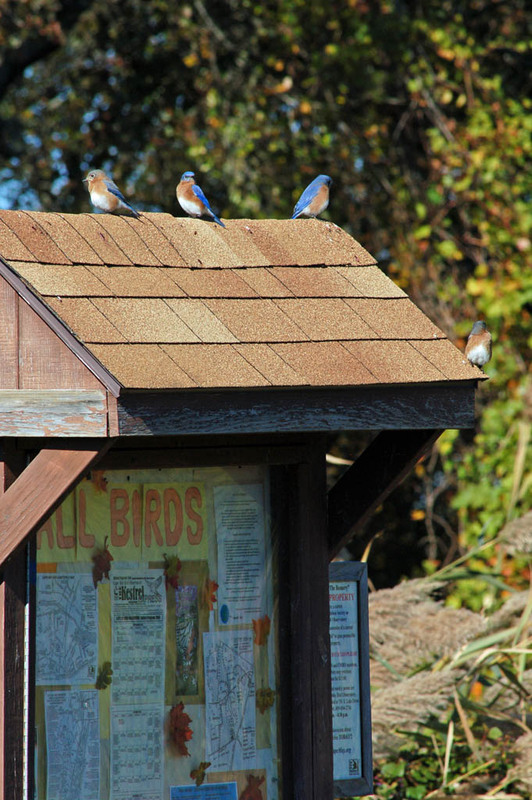 Richard Crossley just reported 30 Cave Swallows at Congress Hall in Cape May. Yesterday's first day of the 'Rarities Roundup' weekend that might become a tradition here, produced a reasonable number of birds of interest, though little of true rarity. The above-pictured Long-eared Owl was found by Steve Bauer at an undisclosed (as is typical for this venue) location on Cape Island (photo copyright by Tony Leukering; click on image to see larger version). Observers on the bayshore noted a strong movement of Red-throated Loons (e.g., 44 passing Miami Beach in five minutes around 9:30 am), while the Seawatch scored Harlequin Duck, Little Gull, and Razorbills. As was the case on the previous day, Cave Swallow was the dominant species of hirundine present. In fact, it may have been the only species of swallow noted, with up to 12 being seen (those coming into roost at the Congress Hall; noted by Kathy and Roger Horn), but with the species being seen at numerous Cape Island locales and at the Seawatch. The most interesting bird of the day, however, was the single Common Redpoll noted by Jim Dowdell among a large flock of American Goldfinches at the third field (westernmost) at Hidden Valley. 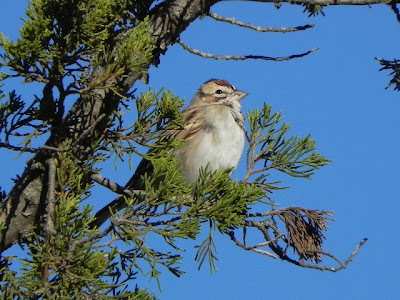 So far this morning, Michael O'Brien noted an adult Black-legged Kittiwake flying past the Hawkwatch, of all places, while Tom Reed found a Grasshopper Sparrow at the Schellenger tract of Cape May NWR among a host of gun-toting hunters. 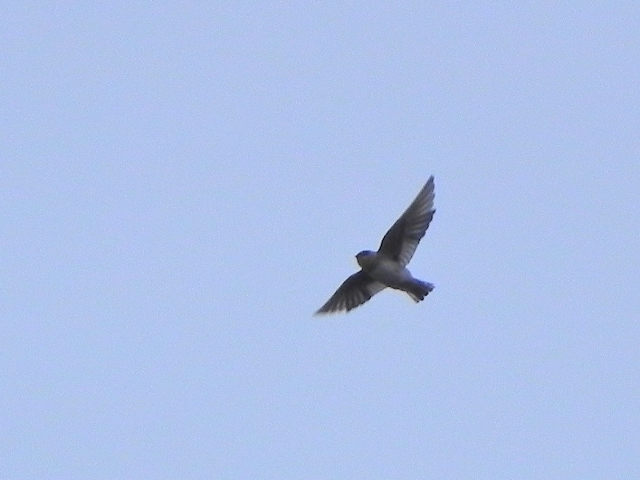 Vince Elia reported that two Cave Swallows were flying around behind Lucky Bones (Melissa Roach reports the species from the Hawkwatch, too) and Glen Davis noted a Northern Goshawk at Tuckahoe. The Seawatch, though experiencing a less-than-steller flight today, still has scored a fly-by Red-necked Grebe and the lingering adult male Harlequin Duck. The story yesterday (Sunday) was the Avalon Seawatch, and the place to read about it is Steve Kolbe's account on View From the Field, though the action offshore was certainly visible pretty much anywhere along the coast. In the hour or so I spent at the seawatch yesterday afternoon, a Red-necked Grebe (picked by Doug Gochfeld), several small flocks of White-winged Scoters, and 4 Common Eiders spiced the incredible passage of Northern Gannets, Red-throated Loons, and scoters. Steve just (10:43 a.m. Monday) had an immature Iceland Gull fly south past the seawatch. The hawkwatch wasn't so bad yesterday, either. Tom Johnson was crossing the parking lot at the state park shouting "Goshawk!" 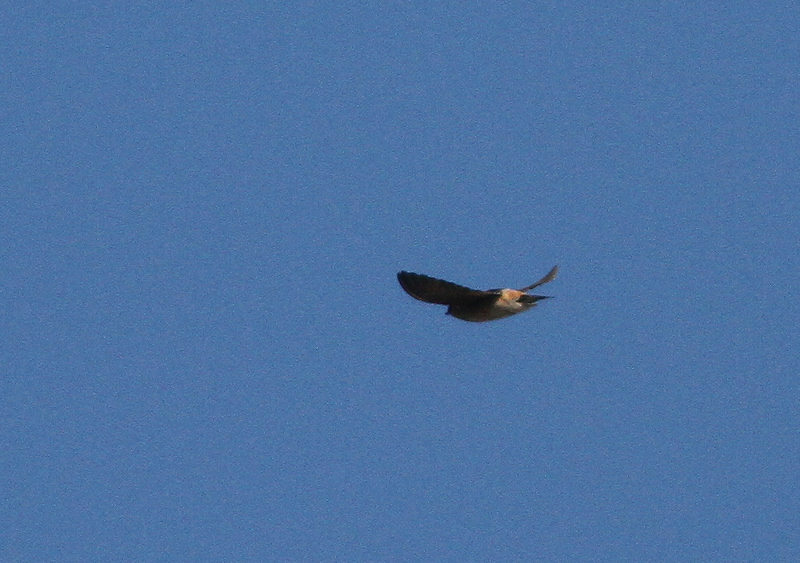 as I got out of my car, while a Peregrine circled over Melissa's head above the platform. Melissa was fiddling with her gloves and hood as the Peregrine circled, and I busted on her when I walked up: "Hey counter, did you get this bird or what?" 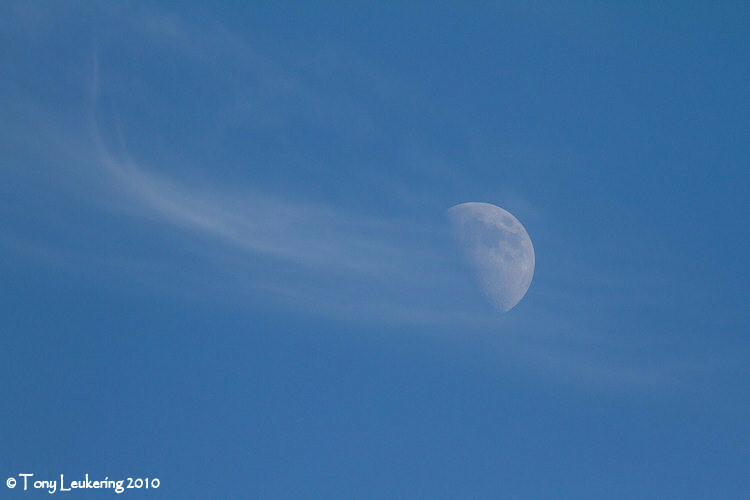 Her reply was something to the effect of having been on that Peregrine since it was over Cape May City. . . which is often the case, the counter picking and clicking a bird before peanut gallery types like me know. I was working Higbee Beach for Orange-crowned Warbler yesterday morning (unsuccessfully), and a Clay-colored Sparrow popped up from the sorghum in the third field. After taking a few photos with my loaner camera, I texted it to the locals and then looked at the shots. . .to realize that I had been photographing the moon last night, never reset the exposure, and my "confirming" photos were underexposed 2.5 stops and essentially black! Meanwhile, Vince Elia shows up and we look for the bird and can't refind it. Later on the hawkwatch, I got a litle razzing. . ."Yeah, well, I saw Don's truck at Higbee and was hoping when the text message came through it would be him with something good, and it was, but then we couldn't find the bird, and he said he took pictures but there was something wrong with the camera, hmm. . ." I said "I thought I had some 'street cred' around here. . ." All in good fun, of course, but I wouldn't blame anyone for asking questions about a rare bird. It's getting late for Clay-colored, though there are a very few winter records. Tony had a nice batch of waterbirds at Poverty Beach including 47 (!) Common Eiders, all three scoters, 2 Great Gormorants and 2 Royal Terns. Poverty Beach is the beach north of Cape May City, including the pilings off the Coast Guard Station, where you can't go but which can be scoped legally from the south. 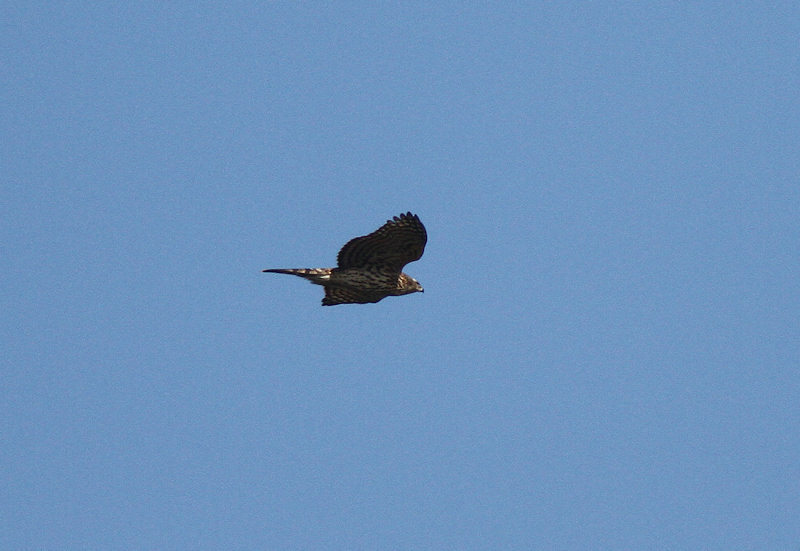 A Northern Goshawk was seen perched at the Cape May Point State Park Hawk watch. 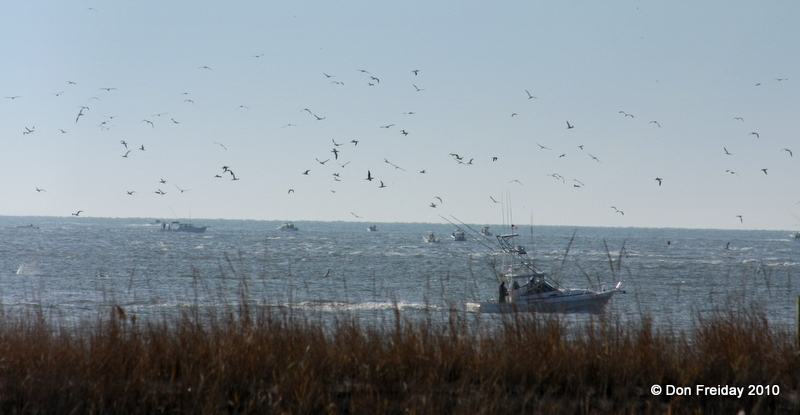 A trip around the dike loop at Brigantine a.k.a. 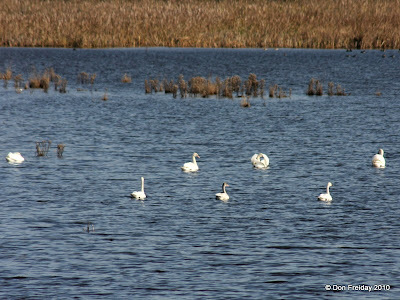 Forsythe NWR yesterday afternoon featured birds with upturned bills, including 4 American Avocets in Turtle Cove, looking south from the south dike observation tower, nicely spotted by Kathy Horn. It was a low low tide thanks to the full moon, and the long-legged American Avocets were way out with the ducks in the cove. The other upturned bill was in front of a Hudsonian Godwit that flew over us on the north dike, giving a single-sylallable call. The godwit settled on the marsh a couple hundred yards north of the north dike. A flock of 25 Snow Buntings bounced around various bare rocky patches between the north dike and the channel north of it. 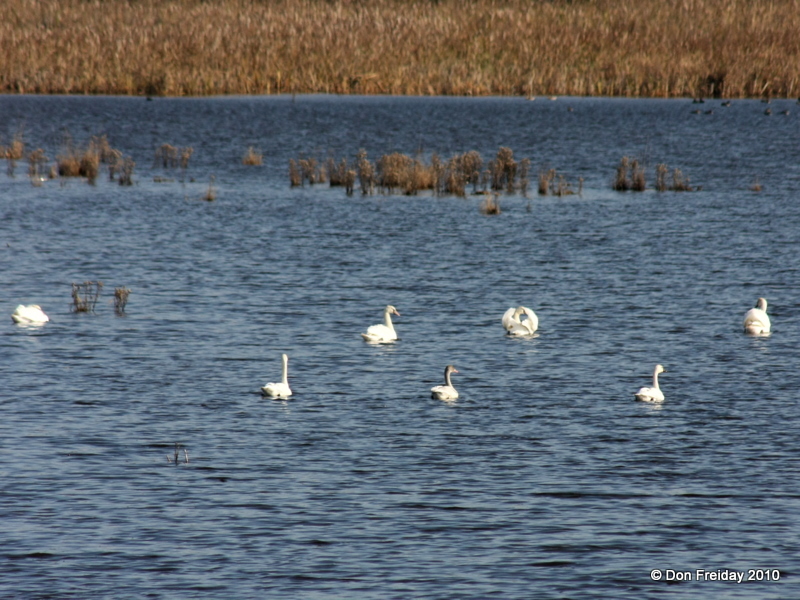 Brig was packed with ducks, especially Green-winged Teal and Northern Pintail, which were in the thousands, as were American Black Ducks, not mention 50+ Tundra Swans, including some pink-billed juvs. I hear 18 Tundra Swans flew over the South Cape May Meadows today. 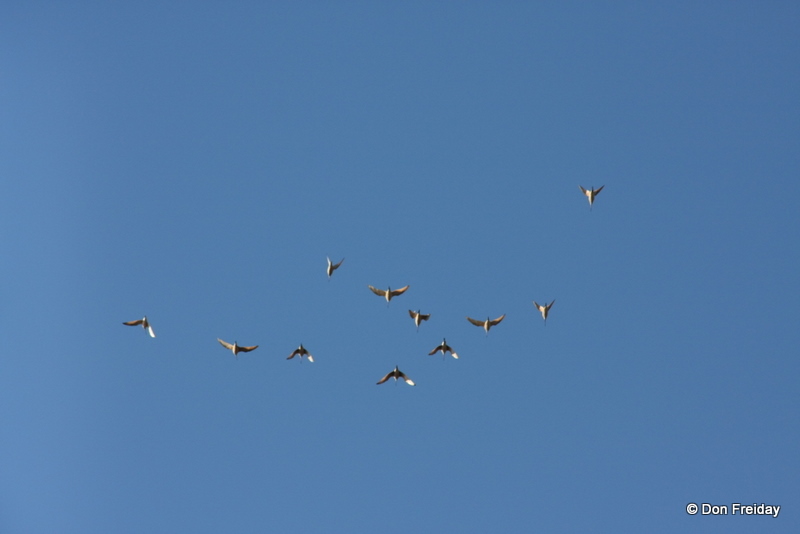 By climbing the south dike observation tower at Brig and looking north over the west pool, scoping over the dike that runs through the center, it was possible to see a neat mixed flock that contained 17 Canvasbacks, Ring-necked Ducks, a few American Wigeon, and both scaup. The duck mix was further spiced by Hooded and Red-breasted Mergansers, Wood Duck, Ruddy Ducks, and Bufflehead, all scattered throughout the refuge. 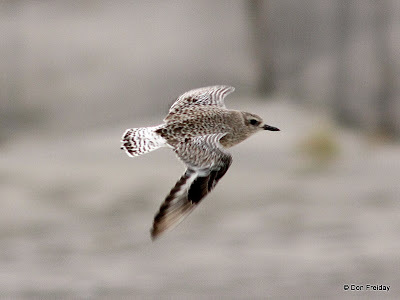 We ran into the group headed by Scott Barnes and Lloyd Shaw from SHBO, who had Cave, Rough-winged, and, rarest for the latest of the season, Bank Swallow, plus a Least Sandpiper. Nobody seems to have found the American Golden-plover reported at Brig earlier in the week, nor did we find any Rough-legged Hawks, though multiple Bald Eagles were evident most of the time and a couple Merlins blew past. 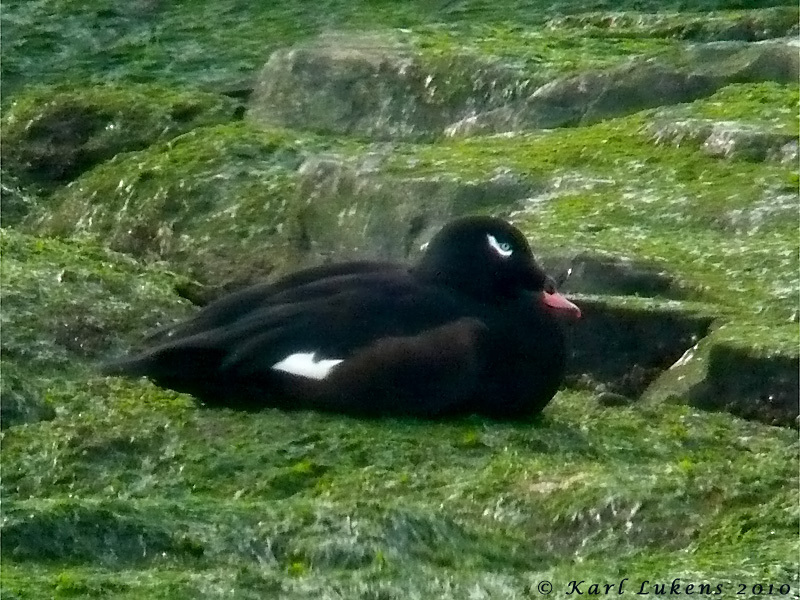 All three scoters and several Common Eiders were off St. Peters in Cape May Point yesterday. 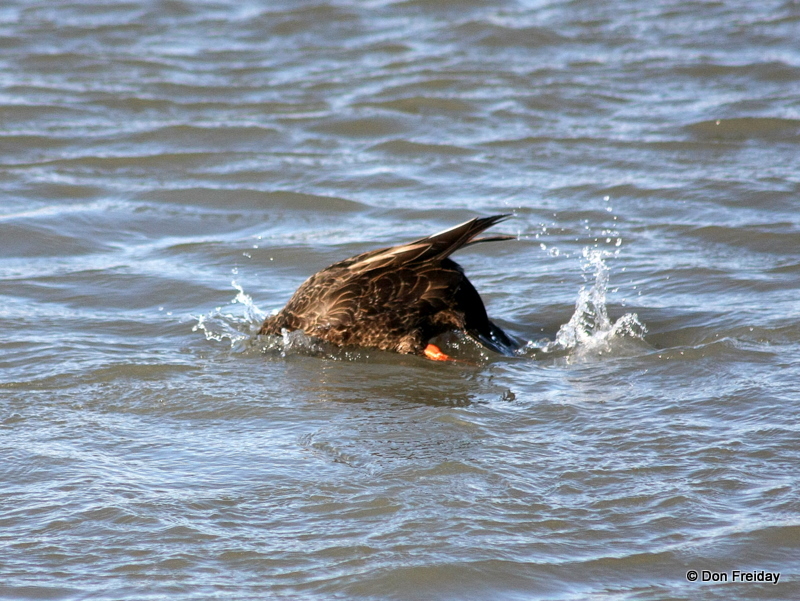 Speaking of sea ducks, there is still room on our Harlequin Romance field trip to Barnegat Light on Saturday, December 4. I've led this trip annually for what seems like forever. . .and over the years, besides the guaranteed Purple Sandpipers and Harlequins, have had Black-legged Kittewake, both white-winged gulls, Razorbill. . . it's a good spot. Our annual Kick Off Your Year List in Cape May trip - New Year's Day, of course - also has spaces open. 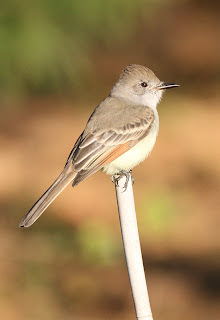 The ASH-THROATED FLYCATCHER was last reported from Cape May Point State Park on Saturday, November 13th, 2010, at the big wooden gate along the blue trail. 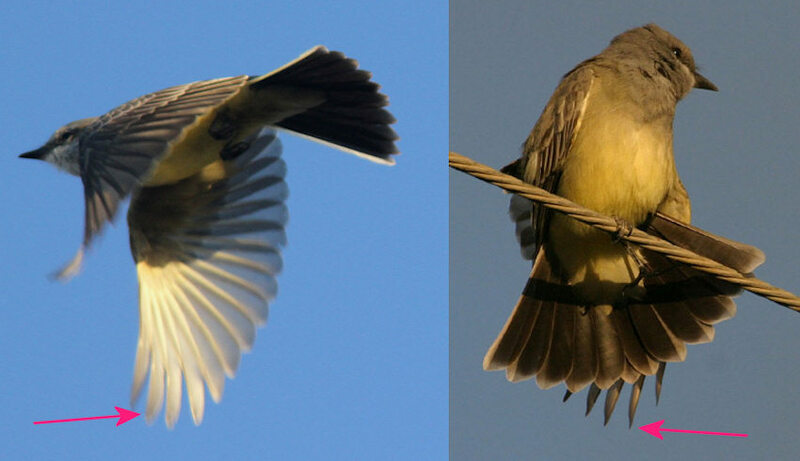 The WESTERN KINGBIRD was last reported at the intersection of Sunset and Columbia in West Cape May on Saturday, November 13th, 2010. 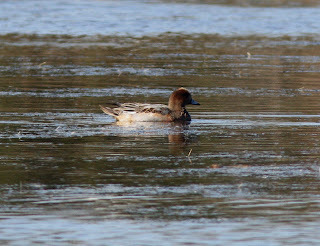 A drake EURASIAN WIGEON has been frequenting both the East and West sections of Lighthouse Pond, and was last reported on Friday, November 12th, 2010. 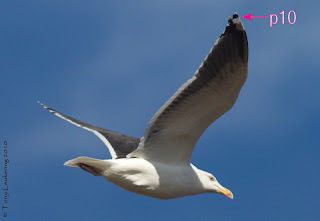 A juvenile BLACK-LEGGED KITTIWAKE was seen heading south from the Ferry Terminal on Sunday, November 14th, 2010. A young male KING EIDER briefly joined a flock of Common Eiders at the Avalon Seawatch on Tuesday, November 16th, 2010. 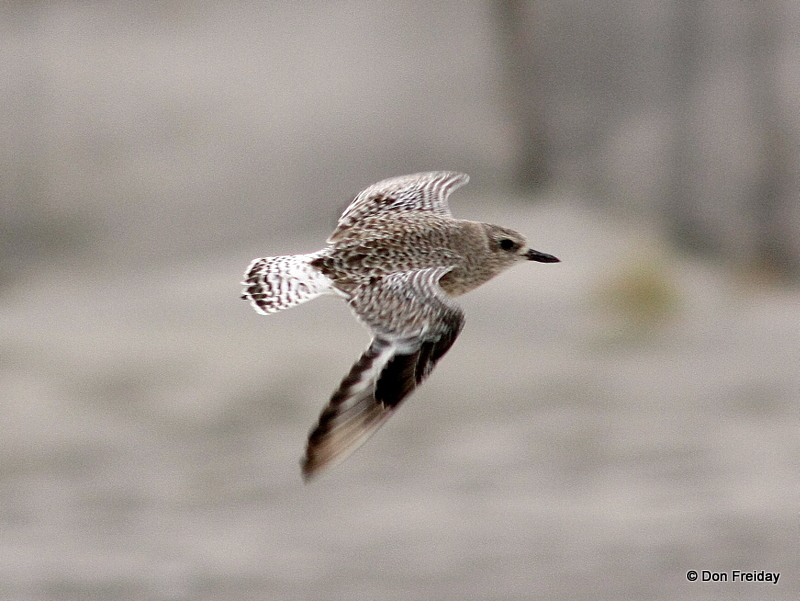 If you think you know what the mystery bird below is, feel free to send an email with your i.d. to the address above for reporting sightings. 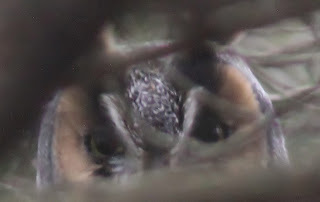 I've gotten a few guesses, or should I say identifications, already, including a couple correct ones. The NJ Chapter of the Wildlife Society met up at Assunpink yesterday for a valuable but sobering program featuring the gulf oil spill and oil spills in general, with presentations by staff members of Tri-state Bird Rescue and the US Fish and Wildlife Service who had been there. 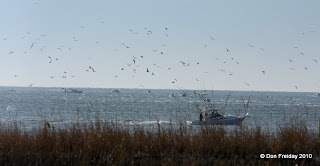 We managed 40 species in the pea soup at the South Cape May Meadows on the last of that weekly walk for 2010. The birds were not without interest - a flock of 20+ Lesser Scaup had dropped into the plover pond, and ~ 5 "Ipswich" Savannah Sparrows ran about amidst the beach grass near the pools left by recent flooding tides. These were the first of this race I've seen, or heard about, this fall. The full lists from this as well as the various weekend field trips are up on Field Trip Reports. It might be a good time for a trip to Brigantine a.ka. Forsythe NWR, Brigantine Division where (I hear from the Sluggs) there were 2 dark morph Rough-legged Hawks yesterday, and American Avocets continue through at least Saturday, 5 from the south dike and another in the northwest pool, according to Marvin Hyett. Presumably many readers are members of the ABA - that's the American Birding Association, of course - and therefore have received, or will soon receive the November, 2010 issue of Birding. If you're not an ABA member (and if you are reading this blog you should be a member of ABA as well as CMBO), you can read about the next issue on the multi-authored ABA Blog , and therefore about two Cape May'ers. 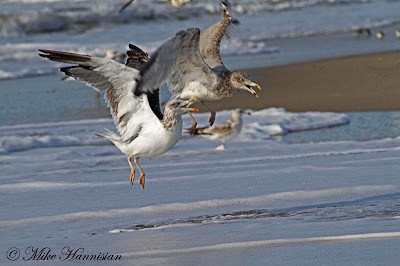 One you already know, through this blog - just scroll down to Tony Leukering's latest great post on recent cool birds in Cape May, with photos. 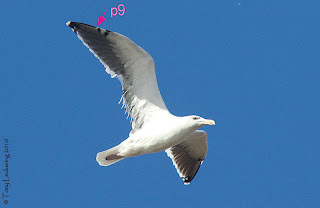 Tony's Birding article deals with large white-headed gulls, and as Ted Floyd puts it, "Tony cuts to the chase, proposes a simple idea, and leaves the rest to the reader. And if you are one of the handful of authentic larophiles out there, listen up: It is possible, as Tony demonstrates, to get an idea across without laborious treatises on tertial fringes and primary “mirrors”—whatever those are." You don't have to look too long at the November Birding to find the other Cape May'er - Louise Zemaitis created the Savannah Sparrow art for the cover! Everyone knows Louise, or should - whether via the Monarch Migration Project, a VENT tour, or a CMBO workshop. And finally, near native (formerly just across the bay, now off to Colorado) Jeff Gordon recently assumed the presidency of ABA - one more reason to join, 'cause with Jeff at the helm, it's going to be good! The Ash-throated Flycatcher at Cape May Point State Park continues on the red trail through Saturday afternoon, per Kathy Horn. 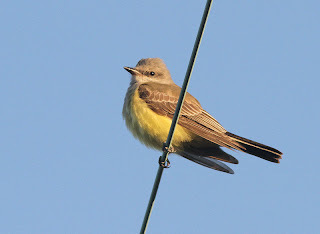 The last report of the Western Kingbird along Sunset Boulevard I am aware of is from Friday. I had business in north Jersey the past couple days, and at least some of the widespread Black-capped Chickadee movement seemed evident, with a flock of 10 consorting in a single tree in a Clinton hotel parking lot and another flock of 15-20 moving along a woods edge north of Spruce Run reservoir. It was a good chance for a refresher on my "home" chickadee - having spent most of my life in Black-capped range, Cape May's Carolina Chickadees still seem tiny, drab, with a hyper chick-a-dee-dee-dee call. This is a difficult i.d. to be sure, but if you've seen a lot of both (and bothered to look at them), a Black-capped in Carolina-land will jump out at you. 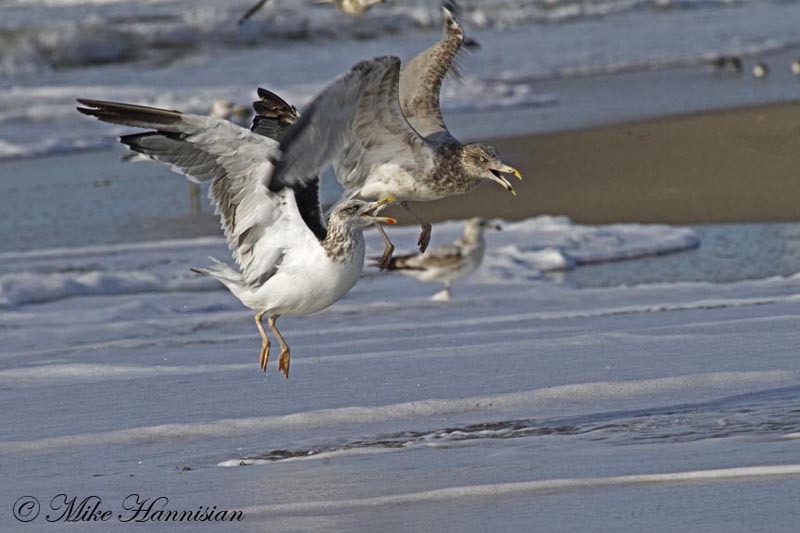 For a fun read, check out Doug Gochfeld's review of the epic October 29-30 flight on View from the Field - scroll down to the November 14 posts to find it, and while you're at it, see what's been happening at the sea watch and hawk watch courtesy of Steve and Melissa. 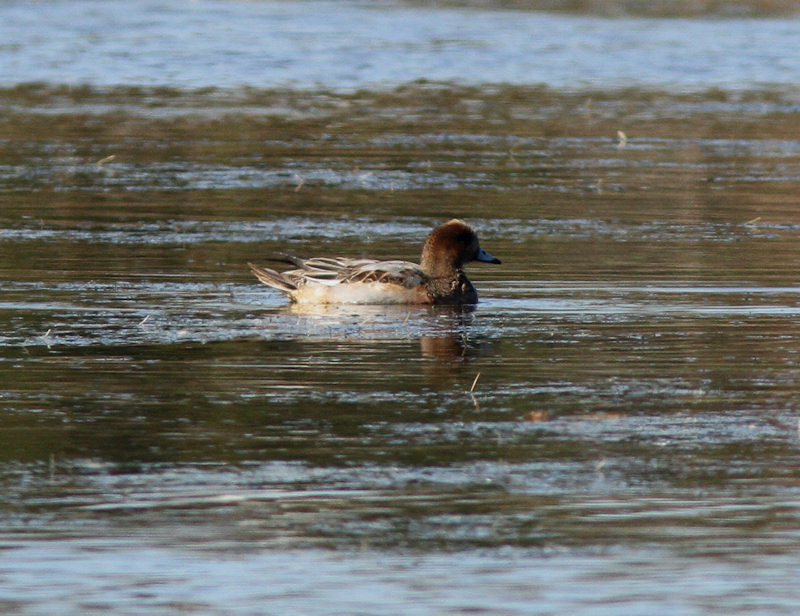 ... Eurasian Wigeon. But, how about we make one more condition: that single date has to be in November, specifically, Veteran's Day, 11 November. 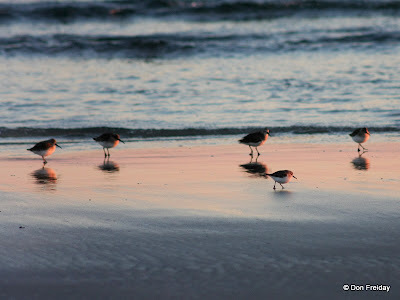 Obviously, this being the Bird Cape May blog, the answer must be Cape May. But, really, where else could it be done? For me, the truly interesting thing about all this is that none of these species are truly eyebrow-raising here. Oh, certainly, Ash-throated Flycatcher and, particularly, Cave Swallow, used to be considered true accidentals, but we dab Cape May hands actually EXPECT to see those in November each year now. Finally, except for the Western Kingbird, I didn't have to leave Cape May Point State Park to nab all of 'em. All three raptors were photographed from the Hawkwatch platform, the Ash-throated Flycatcher (presumably the one first found two days ago near the lighthouse by Mike Crewe) was along the Blue Trail beyond the bridge, the immature male Eurasian Wigeon was on West Lighthouse Pond, and the Cave Swallow was the single bird of the species that we could find today from the platform. Did I say 'finally?' I'm much too verbose to be ending things this soon. No, I wanted to converse about white in Golden Eagles and ageing Western (and other) Kingbirds. 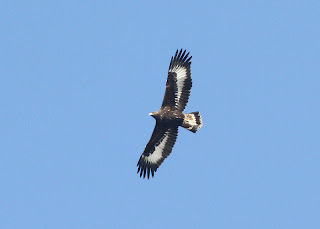 The above juvenile Golden Eagle sports the most white I've ever seen on a Golden Eagle, and I've seen a fair few of 'em. Conversely, the fourth-year Bald Eagle pictured above exhibits just about the least amount of white I've seen on a Bald Eagle! Now, finally (seriously), ageing members of the genus Tyrannus. The age of individuals of all species of kingbird (including Scissor-tailed and Fork-tailed flycatchers) is determinable by studying the bird's outer primaries. 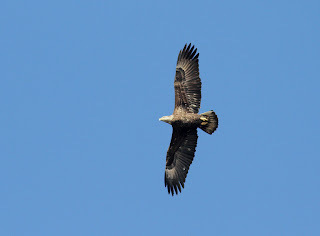 On adults, these feathers are notched, that is, with the trailing edge of the feather cut out -- quite strongly in males, while juveniles sport more typical rounded primaries. 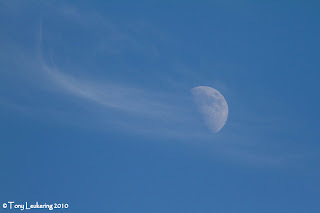 One can see this feature in the picture above, but one can just look at the picture below, too. In the above, the Western Kingbird that Steve Kolbe found yesterday along Sunset Drive in West Cape May (and which was still present today) has the rounded outer-primary shape diagnostic of a juvenile, while the right image shows an adult Cassin's Kingbird (photo taken on the Baja Peninsula years ago) with the very pointed outer primaries typical of an adult kingbird. In this case the bird is probably a female, because males sport even more deeply-notched primaries. An ASH-THROATED FLYCATCHER was found at Cape May Point State Park on Tuesday, November 9th, 2010 and was last seen there near the big gate located on the Blue Trail, on Thursday, November 11, 2010. An EVENING GROSBEAK was seen at a private feeder in Cumberland County on Sunday, November 7th, 2010. A LARK SPARROW was found near the Cape May Point State Park butterfly gardens, located south of the restrooms, and was last seen there on Tuesday, November 9th, 2010. A WESTERN KINGBIRD was found on a wire at the intersection of Sunset blvd. and Columbia Ave. in West Cape May on Wednesday, November 10th, 2010, and was last seen there on Thursday, November 11, 2010. 2 LAPLAND LONGSPURS were observed flying around the Cape May Point State Park “Bunker” on Saturday, November 6th, 2010, and one was seen on a dune crossing at CMPSP on Tuesday, November 9th, 2010. 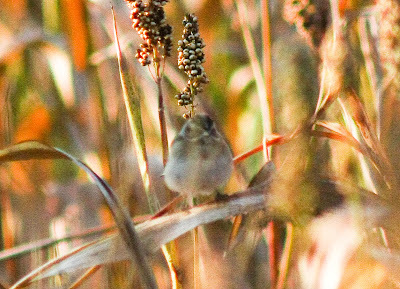 A GRASSHOPPER SPARROW was reported at the Villas WMA on Saturday, November 6th, 2010. A KING EIDER and a HARLEQUIN DUCK were seen at Cape May NWR’s Two Mile Beach Unit’s jetty on Friday, November 5th, 2010. Today's CMBO walk at Two Mile Beach detected a late Scarlet Tanager﻿ in the bayberry on the right side of the boardwalk, as well as a Lapland Longspur and a Tri-colored Heron along Ocean Drive. This morning was a classic Cape May, breakfast can wait kind of a day, when being at Cape May Point State Park early was a good move. I went down to see if yesterday's Lark Sparrow on the edge of the parking lot was going to be obliging, but it turned out that it wanted to hide from me - though Tom Johnson reports that it is still present this morning, near the museum/information building. Scott Whittle showed up with his Tuesday morning photographic walk (everyone keeps telling me how good that is, I must go on it one day!) and we strolled along checking the grass. The next thing you know, we're right by the state park entrance and I realise that I'm casually looking at an Ash-throated Flycatcher! This bird fed along the hedge line on the north side of the parking lot then headed off along the red trail. I suggest looking for it on the east side of the Red Trail loop, out of the wind. 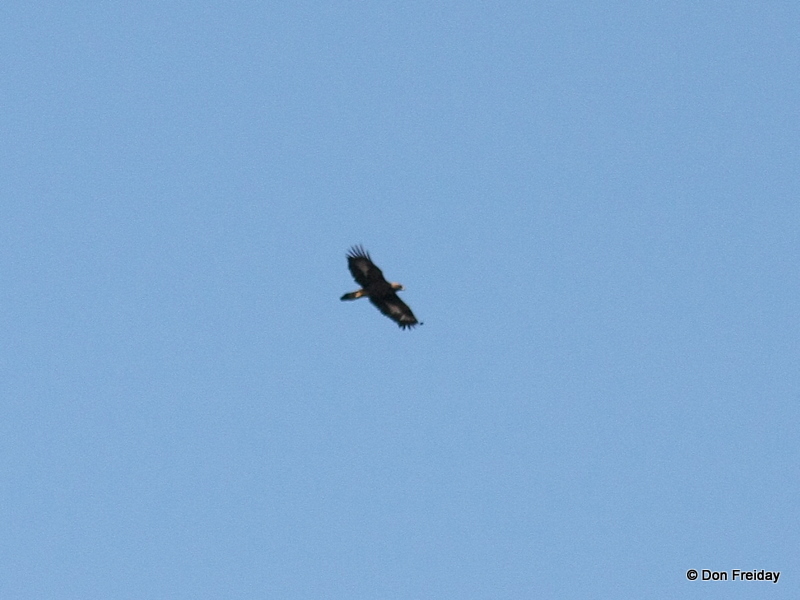 My early morning stroll ended at the Hawkwatch Platform with a stunning Golden Eagle that cut right across the corner of the parking lot while Doug Gochfeld and I struggled with the wrong photographic gear for the job! 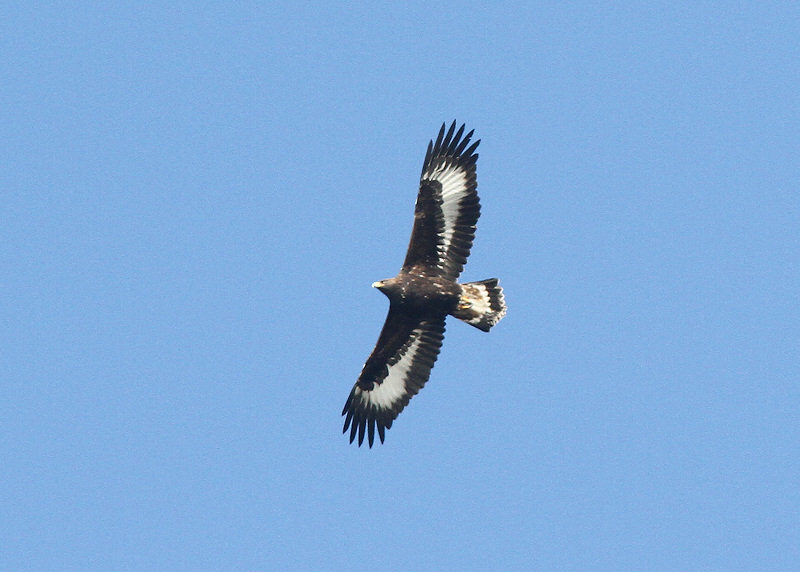 Shortly after, a second Golden Eagle, this one with less white in the wing, appeared over the tree tops to the north-east. It may be November, but migration is far from over at Cape May. If you're stopping by the Northwood Center, don't forget to check out of the windows at our feeders; currently we have five Pine Siskins, three Purple Finches and the first returning Fox Sparrow here, as well as plenty of American Goldfinches, White-throated Sparrows and still both Red-breasted and White-breasted Nuthatches.